One would presume that a dialogue between an eminent ecologist and a Cambridge schooled economist would lead to a war of words since they seem to represent diametrically opposing spheres of thought. The recent past bears testament to the destruction of nature and eco-systems all in the name of progress and development. Could there be common ground for two professors who epitomise excellence in their respective fields? Any doubt in this respect was cleared up on the 31st of January when Professor Madhav Gadgil and Professor Amit Bhaduri engaged in a public dialogue entitled ‘Development and Environment’. This conversation was a precedent in itself where the two great minds converged under the Visiting Research Professorship Programme at Goa University. The dialogue, which was held in the conference hall of Goa University from 11 a.m. to 1 p.m., definitely enthused the audience, among whom were faculty and students of Goa University and members of the general public. 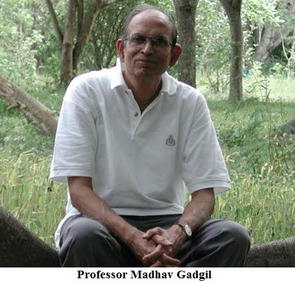 Professor Madhav Gadgil, alumnus of Harvard University, is a well-known personality in India. This is mainly due to his involvement in the introduction of careful quantitative investigations in ecology and animal behaviour and including humans as an inseparable part of the ecosystems in India. He has also founded the Centre for Ecological Science in India. Apart from winning awards for his original research in economics, Professor Amit Bhaduri has held teaching positions in universities all over India, the USA and Europe and served as research consultant to the ILO (International Labour Organisation), the UN, the Development Bank of South Africa and numerous other organisations and commissions. Opening the dialogue with a touch of humour, Professor Gadgil mentioned being queried by another journalist as to whether the dialogue would rouse controversy because of opposing viewpoints. But Professor Gadgil cast aside any such fears by asserting that there is no contradiction between economics and ecology. In fact there are many values in common, old human values, and their genesis can be traced as an inherent part of human evolution. Humans have an elaborate array of relationships and social interactions. Within these relationships one can witness the concept of ‘reciprocal altruism’ which was put forward by Robert Trivers. It means one organism will act in a way that may cost it some sacrifice, in order to benefit another. But it does so only in the hope that the favour will be returned at some further point of time. As long as people function in this manner there are no problems. However, there is also the human tendency to be corrupted by power. While they can use knowledge in a beneficial manner, this knowledge can also be used detrimentally, resulting in freeloading and manipulation. The attitude of people towards the preservation of nature and natural resources depends upon whether the individuals are largely dependent on the natural world (Unorganised sector of economy) as against those who are not (Organised sector of economy). An example could be the dependency on natural springs for agriculture and horticulture. Those in the mining sector who are not dependent on natural springs have no qualms about polluting these water sources. Mining, sand mining, stone quarrying, etc. claim development and provision of jobs but Professor Gadgil specified, ‘Development is not growth of GDP.’ To stress his point he said, ‘Vikas means development and in Jain philosophy it means increase in the storehouse of the happiness of people.’ This is something that is not necessarily the outcome of economic prosperity. Professor Bhaduri commenced his part by referring to Wittgenstein’s philosophy of the ‘language-game’. He said, ‘Development is a language-game – the context is important. The notion of development differs due to the language game.’ The media has an extensive role to play in this game of manipulation. Development can be categorised as people oriented development that provides employment rather than GDP growth and corporate oriented development which is media projected. With regard to this Professor Bhaduri with levity quoted a South American dictator who said his country had wonderful development but the people were not doing so well. Continuing on a more serious note, however, he spoke of the employment growth during Nehru’s time being 3.5 per cent while in recent times it has decreased to 0.1 per cent. This is an effective gauge of true development. Attention was drawn to the uniform pattern in which most extremist affected areas happen to be places that have been devastated and denuded by mining. Large strips of land are mined resulting in a huge loss of livelihoods. This leads us to the understanding that destruction of the environment will only cause decrease in employment as there is 30-50 per cent dependence on common property i.e. forests, mountains, rivers, etc. India has been subjected to ‘internal colonialism’, where natives of a region are told that they have no right to live there or participate in profits, as in the case of Vedanta in Orissa where the tribals were to be uprooted and were told to wait three years to benefit from profits. Their survival was in question since they have a culture so distinct that their integration with mainstream society would be next to impossible. This is the predicament that spurred activists to fight for tribal rights. Professor Bhaduri admitted that regulations were pretty much useless when the law machinery and other authorities were flawed. The subversion of policies to aid the poor man and the capitalist alike, such as investment incentives (tax breaks, free water, etc), was brought in by Professor Madhav Gadgil. He spoke of how raw material was available to a factory at an abysmally low rate and that same material was sold otherwise at a much higher rate to those who in actuality could not afford it. He also commented on the obfuscation of CSR (Corporate Social Responsibility). An estuary was forcibly taken over by a factory owner and the fishing community was divested of its occupation. The irony is that the CSR of the factory was to provide tailoring classes for the fisherfolk. This frustrated the locals immensely. On a question related to the mining situation abroad, the audience was informed that in Sweden mining is done without any hostile effect on the environment. Germany’s Rhine was once very polluted but the Germans made sure the Rhine recovered its original state. The capitalist there are satisfied with their modest profits and work towards keeping the environment safe.